The standards describe reference points or signposts of achievement at each year level. Assessing progress and achievement in relation to the standards is an integral part of teaching and learning across the New Zealand Curriculum. We are working towards using the National Standards, to provide consistency when considering, explaining and responding to student progress and achievement. At Pakiri School, we are building a picture of every individual child’s progress, using a mixture of assessment tools and teacher judgement. We report on student progress to parents twice a year, in June and December. 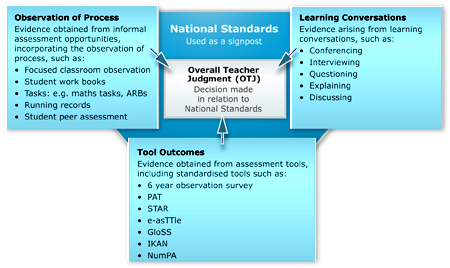 How Does Whakamarama School Assess Against the National Standards? Because the National Standards are benchmarks of student achievement and not tests, teachers are required to use a range of assessment data to make an Overall Teacher Judgement. An OTJ involves drawing on and applying the evidence gathered up to a particular point in time in order to make an overall judgement about a student’s progress and achievement. Why use Overall Teacher Judgement? No single source of information can accurately summarise a student’s achievement or progress. Overall teacher judgements (OTJs) of achievement and progress involve combining information from a variety of sources, using a range of approaches. How Well is My Child Doing? Information leaflet for parents, families and whānau about National Standards.